Following the huge success of Downton Abbey, actress Michelle Dockery swapped the politics of the upper classes for a rather grittier way of life, Stateside, as Good Behavior’s desperate female con artist desperate to make good a challenging past. With such divergent roles, there’s only one place to head for the Essex-raised 35-year-old – the West End stage. 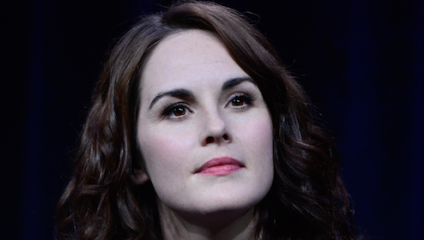 Sure enough, Dockery returns to the live circuit, and to the National Theatre where she made her debut back in 2004, in the adaptation of the hit film Network. As Downton Abbey’s unsympathetic Lady Mary Crawley, Michelle Dockery became famed for her cool remarks and restrained disposition, but in reality, this driven, ambitious and incredibly malleable artist is far warmer and considerably more enthused than her pearl-wearing alter ego. Returning to the West End is a pleasure for Dockery, but she readily accepts the role Downton played in her progression both as an actor and person. Turning Dockery into a household name almost overnight, it was evident her next move had to be one that was carefully considered, and indeed it materialised to be as far from as Lady Crawley as one could get. Taking the lead role of Letty Raines in Good Behavior, an American drama show based on the novella series by Blake Crouch, she played a drug addict and a thief desperately trying to get her life together in a bid to regain custody of her son Jacob, having been release released early from prison for ‘good behaviour’. “I have always been worried about being typecast, and probably went as far the other way as I could on that one,” she says. “I think that was a real intention – the other was simply to try out different places and different roles, so it fitted perfectly. “I mean, it would have been difficult to turn down anyway. When I first read the script, I couldn’t put it down. My character Letty, much like Mary, is a very complicated woman. So, although it's very contemporary, there's a sense the characters aren't very far from each other. Now back in the UK, rehearsals are progressing well for the stage adaptation of Network. She plays Diana Christensen, the role which won an Oscar for Faye Dunaway in the 1976 film. Starring opposite Bryan Cranston, the production is adapted by Lee Hall and directed by Ivo van Hove, and runs from November right the way through to the end of March. “It’s another new challenge and it will be really special to get back on that stage,” Michelle says. “Your professional debut is always something that you should cherish, and His Dark Materials was certainly that for me. I was very young – 22 or something – and it was incredible to get under those lights and really throw myself into it.” That debut gave way to further productions Burnt by the Sun and Pygmalion, the former landing the actress an Olivier Award nomination for Best Supporting Actress. “Theatre is special and different from anything else,” she offers. “It’s you and an audience – it’s intimate, warm, but intensely challenging and there are no second chances. Michelle Dockery appears in Network is at the Lyttelton Theatre at The National, from November 4th. Read our interview with her co-star Bryan Cranston here.